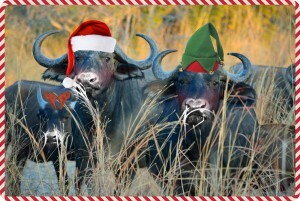 ‘Tis the season when business starts slowing down in the Luangwa Valley but one thing is for sure – It’s beginning to look a lot like Christmas. The Christmas boxes for all our staff are prepared, does not matter if they were naughty or nice and Dora’s menu for lunch on the 25th of December is ready. She’s making a list, checking it twice to make sure that all the ingredients will arrive on time from Lusaka. 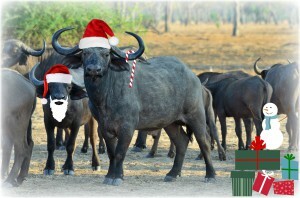 Somebody once sang that they were dreaming of a white Christmas and even though Zambia is not known for its snow (nor is it known for its reindeer, but we have buffalo), we are all dreaming of a wet Christmas. ‘Twas the night before I wrote this newsletter and dark clouds built up in the east but it did not bring much rain. At the time of writing only 42mm of rain has fallen over Wildlife Camp, 122mm less than last year at the same time. All I want for Christmas is rain. Some rain would cap off another wonderful year here at Wildlife Camp. It was a year in which we made many improvements but through all that we stayed true to our good old fashioned safari camp feel (except that we offer wi-fi over lunch time). We’d like to thank each guest, each stakeholders, each tour operator and travel agent and each member of staff for making 2014 a fantastic year. Our new year’s resolutions for 2015 will be to keep improving, keep offering our guests the best value-for-money safaris in Zambia and to keep on loving the amazing bush and all her inhabitants in which we are lucky to live. If you have a safari on your new year’s resolutions list, why not e-mail us at info@wildlifezambia.com to find out more about Wildlife Camp, the special packages we offer, South Luangwa National Park or Zambia. Hopefully we’ll see you here with us soon. But, you’d better watch out, there might just be a hippo outside your chalet. Merry Christmas and a happy new year from Herman, Dora, Retha, all our staff and Boo the dog.